Normally we tell that if you stay invested in Equity for 5- 7years, you tend to get good returns....at least inflation plus. But as we see in the image, an investor not only made less but even lost his capital even after staying invested for 7 years. So why should he invest in equity? 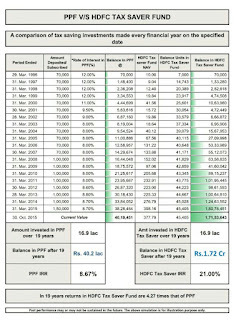 Which investor in his senses will think of investing in Equity when the Principal Amount has not grown at all whereas at the same time, both PPF and NSC have more than doubled?? Now observe this image....for the same period the fund we have selected has risen from 10k to 47k when the Nifty has gone negative (remember 7 years!). Now where does the funds invest? Equity? Where does the Nifty reflect? It just shows the difference between investing in Nifty/Sensex on your own and investing through Experts in the form of Fund Managers. So, the point here is, I am advising/requesting you to invest in Equities but via Mutual Fund route and not directly. Of course, if you are confident of being able to digest these kind of losses and stay put, please go ahead but common sense, suggests, that if you are looking for Equity exposure, then Mutual Funds is the route to go. Secondly from 3000 to 24000 currently 8 times increase meaning Rs 10 nav must have grown to 80 but the answer is 340, again reiterating how good the Fund has been managed. If someone saw just the 1st Image, he would never ever touch equities in his life, here's where you have to understand the power of Mutual Fund. Direct Equity people may tom-tom their winnings, but I have been in Stock Markets for 25 years now and in Mutual Funds for 20 years and I can vouch for the fact that THERE ARE MORE WEALTHY INVESTORS THROUGH MUTUAL FUNDS THAN DIRECT EQUITY INVESTMENTS. I can fight anyone on this with proven DATA that I have collected over the years. So, friends, if you want to save Tax, you have to understand that it;s got to be Equity Linked Savings Scheme. 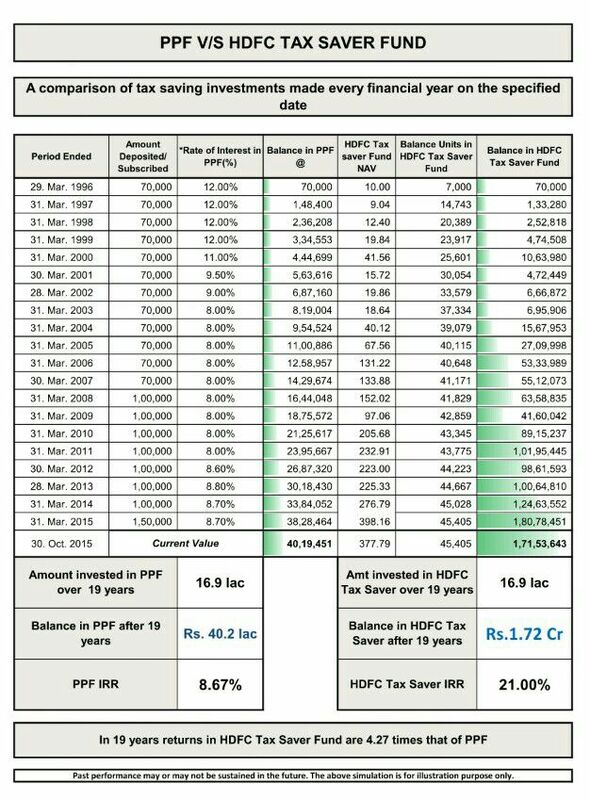 I am not projecting HDFC Tax Saver Fund. You choose ANY ELSS, you will always find that the Fund has clearly beaten the Nifty/Sensex by a wide margin. So, this Tax Season when you are thinking of saving tax, better weigh the options and then decide sensibly. There is no other better option than Equity Linked Savings Scheme! And, when you have decided to go for an ELSS, dont invest in a Brand. Ask your Advisor, he will be in a better position to guide you.